ANOTHER SWING. 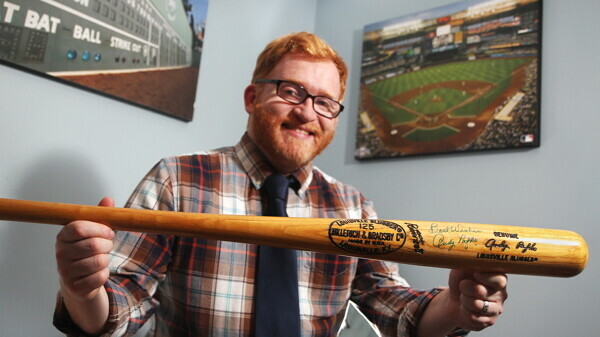 Author Joe Niese shows off a bat autographed by Wisconsin-born slugger Andy Pafko, the subject of Niese’s latest baseball biography. 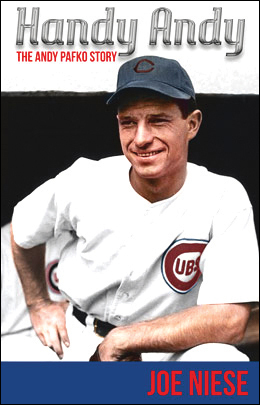 Pafko played for the Cubs, Dodgers, and Braves. In a strange way, I’ve been interviewing local author Joe Niese about his new book, Handy Andy: The Andy Pafko Story, for almost three years now. And, I haven’t become tired of hearing Niese talk about his love of Pafko yet. In 2012, Niese’s book Burleigh Grimes: Baseball’s Last Legal Spittballer was released. Because I moonlight for other publications (gasp! ), I actually had the chance to write about the Grimes book a couple of times. And while I could see that Niese had taken great care curating and crafting the narrative, I could see a little bit more of a twinkle in his eye as he described Handy Andy. At the outset, both Grimes and Pafko seem like very similar subjects. They grew up just a few miles from one another in western Wisconsin (Grimes in Clear Lake, Pafko in Boyceville), worked very hard doing manual labor in the country, and both could play their hearts out on the diamond. But that’s where the similarities seem to end. Most obviously, Grimes is remembered for his prowess on the mound, while Pafko was quite a slugger. Also in Grimes you see a very brash player not afraid to throw a punch, while Pafko seems to be the stereotypical likable person from Wisconsin. Then there’s also the fact that they began their careers a generation apart: Grimes played for seven teams between 1916 and 1934, while Pafko was a Cub, a Dodger, and finally a Milwaukee Brave from 1943 to 1959. In this book, Niese also seems to have grown more comfortable as a writer, and it shows through that he really likes Pafko. This kind of intimate comfortability with a subject is something that only comes from intense research spurred on by admiration. “I was very concerned with cramming every morsel of info into the Grimes book,” he says, “Which might be exhaustive and too academic for some. Part of this comfortability could also come from Niese not only writing this book but also crowd-funding and self-publishing it as well. Niese says that self-publishing the book gave him a fresh perspective. ”I went in pretty blind, so it wasn’t until I was actually finished that I realized what I had to do to self-publish,” he says. To show just how much admiration Niese has for Pafko, he is releasing his book on Pafko’s birthday, Feb. 25, at the public library in Boyceville, Pafko’s hometown. However, if you are not as much of a purist as Niese and me, you can also go to the soft release Feb. 19 at the Chippewa Falls Public Library, where Niese recently became director. Handy Andy: The Andy Pafko Story is available online at www.joeniese.com and at The Local Store, 205 N. Dewey St., Eau Claire.